Lt. Dylan “Raven” Massin (McQueen) has just finished his Navy survival training. He must leave his loving wife Clarissa (Thompson) and go live on an aircraft carrier and go on flight missions with his partner Lt. Lori “Dakota” Forrester (Shatner). When trouble brews in Iraq in the form of a guy who looks nothing whatsoever like Saddam Hussein but is in fact the Soup Nazi (Thomas), U.S. forces are marshaled to go fight in that part of the Middle East. But that also includes surly Gunnery Sgt. Zach Massin (Madsen), who is the estranged half brother of “Raven”. Estranged because they don’t get along well and they had a fight over a girl many years previously. They’re the original odd couple! Can the two bickering brothers come together long enough to be victorious in the name of their country? (don’t bother to) find out today! 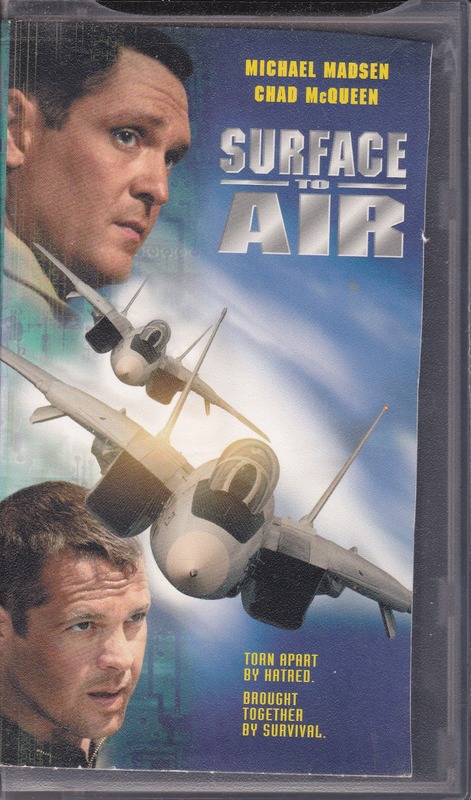 Surface To Air is one of those movies with more airplane and military jargon than much-needed character development and exciting situations. While characters are spouting some meaningless gobbledygook during some stock footage of aircraft carriers, the audience is bored to tears. Who exactly is the intended audience for this sort of movie? 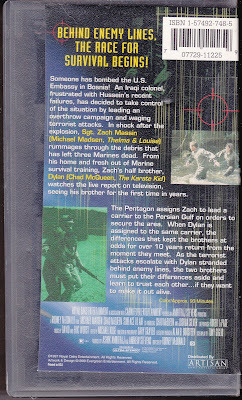 Laypeople will be bored, and servicemembers surely won’t want to see Chad McQueen Chadding it up with some CGI/green-screen plane explosions. It seems movies like this were pretty prevalent at the time: Desert Thunder (1999), Stealth Fighter (1999), later Air Strike (2002), etc. It’s nice that they are patriotic, but they’re not doing patriotism any favors. As far as Chad McQueen is concerned, Raven is obviously the new Skylord. If that sentence immediately made any sense to you, be afraid. It means you’ve seen at least one of the Chad movies at hand. But it’s hard to take him that seriously. He just has a goofy presence, and Madsen has his usual “I don’t care” attitude, so seeing as they made a bunch of movies together around this time, someone thought they made a good team? Speaking of slogs, both this movie and Submarines (2003) both use the made-up news station “ZNN” for their news reports. Coincidence? As this is an Andrew Stevens production, don’t expect much. But maybe some people at Nu-Image saw this and loved “ZNN”. This should tell you how little both this and Submarines have going on. But what this movie really needed was a strong, super-evil bad guy for Raven and Zach to rally together against. Charles as the “Wacky Iraqi” (or, given his pedigree, perhaps he’s more of a “Soup Iraqi”?) should have done more to make the audience hate him. Simply having a very familiar-seeming mustache is not enough. Sadly, despite the presence of fan favorite Michael Madsen, Surface To Air is your standard airplane slog that really has no reason to exist. He can’t save this boring, boring crud that lacks excitement at every turn. If you’ve never heard of this movie - especially mentioned in conjunction with Madsen - there’s a reason why. Avoid. Madsen and McQueen(along with Chris Penn) also teamed up for the serial killer film Papertrail(AKA Trail Of A Serial Killer) and it somehow managed to be even worse then this film. Heard that was pretty bad...we will be watching that soon. Will prepare for the worst! Haha. Not touching this for sure..
Good idea! It is a tough sit. I had the misfortune to watch this - I was hunting for exploding helicopters - and can testify to the fact this film was a stone cold dud. One of the dullest watches I've ever committed to. There was absolute nothing to redeem. Unremittingly awful. Can't agree more! This was awful. A complete waste of time and Madsen's talent. I don't know man, I'm CamSully here from the site Bad@$$ Haven where he talk about films of every kind and pay tribute to celebs/comedians/politicians. Being a Madsen consumer, the worst film he ever made has to be Outrage: Born in Terror, absolutely no terrifying material, just bad acting/direction/pacing but this is so hard to find but it looks hilarious and having seen those reused stock footage films you mentioned, it looks hilarious as well. Also, does Madsen at least kill anyone? Part of the fun of watching their whole resume is counting what movies they get a killing spree in and they get added to the front of our page if they get over 100 (as is the case here for Madsen) but we also like to be able to quote every film on their resume or review it again in some way. I can't find this turkey film on Amazon.com though but even if it's the worst, it might be hilariously bad. Thanks for dropping by our site Shay! Appreciate it. Heard Outrage: Born In Terror was hilariously bad....Surface To Air is just plain bad. Also to answer your question: Madsen does kill a couple people in the beginning...then it is just a submarine slog.